Death signaling by Fas and TNF receptors plays a major role in the control of activated mature T cells. However, the nature of the death receptors, which may be used by the immune system to control T cells that have not acquired susceptibility to Fas ligand or TNF, is not established. In this study, we demonstrate that engagement of distinct epitopes on CD99 rapidly induces T cell death by a novel caspase-independent pathway. A new mAb to these CD99 epitopes, Ad20, induces programmed cell death of transformed T cells as determined by morphological changes, phosphatidylserine exposure on the cell surface, and uptake of propidium iodide. In general, ligation of CD99 induced kinetically faster and more profound death responses as compared with the impact of anti-Fas and TNF-related apoptosis-inducing ligand (TRAIL). Ad20-induced programmed cell death was observed with seven of eight T cell lines examined, and notably, only two of these were distinctly responsive to anti-Fas and TRAIL. CD99-mediated death signaling proceeded independently of functional CD3, CD4, CD45, and p56lck, revealed distinctions from CD47-mediated T cell death responses, and was not influenced by interference with CD47 signaling. In contrast to the effect on transformed T cell lines, Ad20-induced death responses were not observed with normal peripheral T cells. Thus, our data suggest that CD99 is linked to a novel death pathway that may have biologic relevance in control of early T cells. Receptor-mediated death signaling plays a major role in control of immune responses and in elimination of cancer cells and virus-infected cells by CTLs. The major receptors implicated in death control have so far been classified as members of the rapidly expanding TNFR family (1). Of these, the Fas-CD95-Apo-1 Ag has a critical function in the control of mature peripheral T cells by activation-induced apoptosis (2, 3, 4, 5, 6, 7). Ag-stimulated T cells express Fas ligand (FasL),3 and induction of Fas-mediated cell death represents also a major strategy exploited by CTLs to erase targets expressing immunogenic peptide-MHC class I complexes (8, 9). TNFRI/p55 and TNFRII/p75 have also been implicated in death signaling in mature peripheral T cells (10, 11, 12) and, in some situations, CTLs can apparently kill target cells by activation of TNFRs (13). TNF-related apoptosis-inducing ligand (TRAIL) or Apo-2 ligand has recently been cloned (14, 15) and shown to mediate programmed cell death (PCD) following ligation of the death receptors DR4/TRAIL-R1 and DR5/TRAIL-R2 (16, 17, 18, 19, 20). Whereas FasL expression is mostly confined to activated T cells, NK cells, and sites of immune privilege (21, 22, 23, 24), TRAIL transcription is constitutive in many tissues (14, 15). Furthermore, because DR4 and DR5 are also expressed in multiple human tissues (16, 17, 18, 19, 20), expression of antagonistic decoy receptors such as DcR1/TRAIL-R3 and DcR2/TRAIL-R4 is apparently critical in controlling TRAIL-induced cell death (16, 17, 18, 19, 25, 26, 27). Various tumor cells are highly responsive to recombinant soluble Apo-2 ligand or TRAIL (28, 29), possibly as a consequence of down-regulated expression of TRAIL decoy receptors (1, 17, 18, 19). Thus, CTLs may use TRAIL exposure as a strategy to eliminate some targets (30). The role of TRAIL in control of normal T cells and immune responses is not clear, but it has been reported that a subset of IL-2-stimulated mature T cells apparently acquires sensitivity to TRAIL-induced cell death (31). Activation of caspases plays a major role in the recognized death pathways used by the immune system to control T cell responses and apparently also in killing of target cells by CTLs (1, 32). Ligands of the TNF superfamily initiate death signaling by inducing receptor oligomerization, recruitment of distinct adapter molecules such as Fas-associated death domain protein for Fas, DR4, and DR5 (33, 34) and both Fas-associated death domain protein and TNFR-associated death domain protein for TNFRI/p55 (35) to the death domain of the receptors and subsequent activation of caspases (1). Caspase activation has also been implicated in perforin-granzyme B-mediated killing of target cells (36, 37, 38, 39). Normal mature peripheral T cells need days to develop susceptibility to Fas- and later TNFR-mediated death signaling (3, 4, 7, 11), and expression of TRAIL decoy receptors apparently protects them from TRAIL-induced apoptosis (17, 18, 25, 26, 27). Also, virus-infected cells and tumor cells may develop immune privilege as a consequence of acquired strategies aimed at interfering with normal activation of caspases (40, 41, 42, 43, 44). Together, these data may suggest that the immune system can exploit additional DRs and death pathways to control normal T cells and also to challenge transformed T cells that are resistant to death signaling by TNF family DRs and/or have developed strategies to interfere with caspase activation. An increasing number of Ags are implicated in activation of nonclassical PCD characterized by a pathway proceeding independently of caspase activation. Thus, ligation of CD45 has been reported to induce a variant form of apoptosis in thymocytes as well as in mature T and B cells (45, 46). Furthermore, engagement of HLA class I molecules may also activate caspase-independent death signaling (47, 48, 49). Recent studies also suggest that CD47 may have a role in regulation of activated T cells by a Fas-, TNF-, and caspase-independent death pathways (50). In addition, other Ags may also have relevance in control of T cells by alternative PCD pathways (51, 52). The MIC2 gene product CD99 is a 32-kDa cell surface Ag with broad cellular expression but with no clear biologic function (53, 54). Studies with mature peripheral T cells show that coligation of CD99 and CD3 may enhance the expression of CD25, CD69, and CD40 ligand, induce T cell proliferation, and also allow for production of TNF-α and IFN-γ (55, 56). In contrast, CD99 has also recently been implicated in apoptosis of immature CD4+CD8+ thymocytes by a caspase-dependent pathway proceeding much more slowly than Fas-mediated cell death (57). In this study, we demonstrate that ligation of distinct epitopes on CD99 rapidly induces death of transformed T cells, apparently by a novel caspase-independent pathway. Thus, our data suggest that CD99 may have a major role as a DR on early T cells. Anti-CD99 mAb MEM 131 (IgM) was obtained from HyberDomus (Rhoon, The Netherlands) and Research Diagnostics (Flanders, NJ), and HO36-1.1 (IgM) was purchased from NeoMarkers (Union City, CA). L129 (IgM) and O662 (IgG3) have been described previously (57, 58). Apoptosis-inducing anti-CD95 mAb CH11 (IgM) was obtained from Upstate Biotechnology (Lake Placid, NY), and DX2 (IgG1) was obtained from BD PharMingen (San Diego, CA). The OKT3 (anti-CD3ε, IgG2a) hybridoma was obtained from American Type Culture Collection (ATCC; Manassas, VA). Murine IgG1 (MOPC-21) control and recombinant protein G were obtained from Sigma (St. Louis, MO). Anti-CD47 mAbs 2D3 (IgG1) and B6H12 (IgG1) were kindly provided by Dr. Frederik P. Lindberg (Washington University School of Medicine, St. Louis, MO). Anti-CD47 mAb Ad22 (IgG1) has been described previously (50). Murine IgM control (TEPC 183) was obtained from BiosPacific (Emeryville, CA). 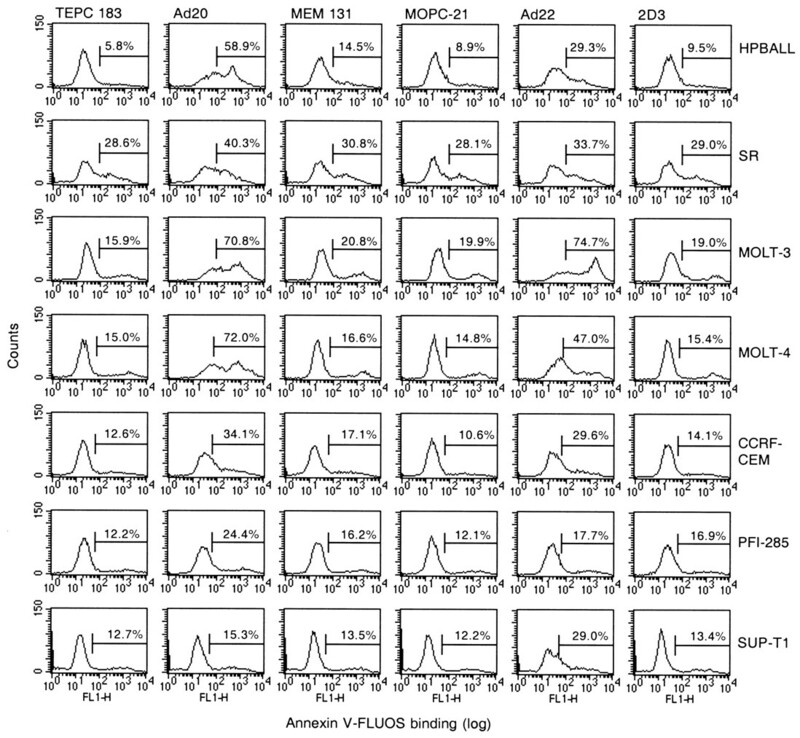 Anti-CD4 (IgG1-PerCP), anti-CD8 (IgG1-APC), anti-CD45RA (IgG1-FITC), anti-CD45RO (IgG2a-PE), and IgG1-PerCP, IgG1-APC, IgG1-FITC, and IgG2a-PE controls were purchased from BD Biosciences (San Jose, CA). FITC-conjugated anti-active caspase-3 mAb (clone C92-605, rabbit Ig), FITC-conjugated MOPC-21 (IgG1), and biotinylated IgG1 and IgM controls were obtained from BD PharMingen. Streptavidin-FITC was obtained from Dako (Glostrup, Denmark). Recombinant human TRAIL was purchased from Calbiochem (La Jolla, CA) and R&D Systems (Abingdon, U.K.). Caspase-I inhibitor V (Z-VAD-FMK) and caspase-3 inhibitor II (Z-DEVD-FMK) were obtained from Calbiochem. Monoclonal Ab Ad20 (IgM) was raised against the immature human T cell line PFI-285 (59) as previously described (60). Ad20 was purified from ascites using fast protein liquid chromatography with a Superose 12-M gel filtration column (Pharmacia, Uppsala, Sweden) and sterile PBS obtained from BioWhittaker (Walkersville, MD). The purified mAb was further sterile-filtered. Human cells were cultured in RPMI 1640 supplemented with 10% FCS, 1.5 mM glutamine, 100 U/ml penicillin, and 100 μg/ml streptomycin (complete medium). The following human cell lines were obtained from ATCC: T cell lines Jurkat E6 and Jurkat derivatives J.RT3-T3.5 (TCRαβ/CD3-deficient), J.CaM1.6 (defective in p56lck kinase expression), J45.01 (CD45-deficient) and D1.1 (CD4 negative), CCRF-CEM, MOLT-3, MOLT-4, and SUP-T1 and myeloid cell lines HL60, U937, KG1a, and K562. The human T cell line SR was kindly provided by Dr. M. Beckwith (National Cancer Insitute, Frederick, MD), and the human T cell line HPBALL and the B cell line U698 were kindly provided by Dr. Gustav Gaudernack (Norwegian Radium Hospital, Oslo). The B cell line C1R was kindly provided by Dr. V. H. Engelhard (University of Virginia, Charlottesville, VA). Jurkat T cells deficient in CD99 expression were obtained by chemical mutation. Jurkat T cells (5 × 105 cells/ml) were cultured for 18 h in complete medium supplemented with 200 μg/ml ethyl-methanesulfonate (Sigma), washed, and allowed to recover for 5 days. CD99-expressing Jurkat cells were eliminated by five rounds of negative selection using the mAb O662 and nontoxic rabbit complement (Behring Diagnostics, Marburg, Germany). Finally, cells were labeled with FITC-conjugated O662 mAb and, CD99-negative Jurkat cells were sorted using a FACStarPlus (BD Biosciences). Chinese hamster ovary (CHO) cells expressing CD99 have been described previously (58). Experiments on human cell lines were performed on 5 × 105 cells/ml cultured in 24-well cell culture cluster plates (3524; Costar, Cambridge, MA) and repeated a minimum of three times in duplicate unless otherwise indicated. Human PBMC were isolated by Lymphoprep (Nycomed, Oslo, Norway) centrifugation. All cultures were grown at 37°C in a humidified 5% CO2 atmosphere. For direct labeling, 5 × 105 Jurkat cells (wild type (WT) or CD99-deficient) and CHO cells (WT or CD99-transfected) were incubated with FITC-conjugated mAb O662 (10 μg/ml) for 30 min at 4°C. Cells were then washed twice and resuspended in PBS with 1% paraformaldehyde. For two-step labeling, 5 × 105 cells were incubated with the primary mAb (10 μg/ml) diluted in PBS with 0.5% BSA for 30 min at 4°C and, after two washes, stained with a secondary FITC-labeled rabbit anti-mouse IgG Ab (Dako). Peptide blocking experiments were performed by incubating anti-CD99 mAbs (10 μg/ml) with synthetic peptides (Appligene, Strasbourg, France; 200 μg/ml) or PBS as control for 1 h at 4°C. Jurkat cells (5 × 105 cells) were then suspended in 200 μl of peptide/mAb solution and incubated for 20 min at 4°C. After two washes and fixation in PBS with 1% paraformaldehyde, binding of the mAbs was detected by incubation with FITC-conjugated rabbit anti-mouse IgG (Dako). In mAb blocking experiments, Jurkat cells were preincubated with mAb Ad20 or mAb O662 (10 μg/ml) for 30 min at 4°C. After centrifugation and discharge of supernatants, cells were further incubated with FITC-conjugated mAb O662 (10 μg/ml), washed twice, and finally fixed in PBS with 1% paraformaldehyde. Flow cytometric analyses were performed using a FACScan (BD Biosciences). Expression of CD99 and CD47 on cell lines was determined with biotinylated mAbs Ad20 and Ad22, streptavidin-FITC, and flow cytometry as described (61). Cells were finally washed twice in PBS and fixed with 1% paraformaldehyde in PBS. Samples were analyzed using a FACSCalibur (BD Biosciences), and data were collected on 10,000 cells. PCD was determined by monitoring changes in cell size and granularity with flow cytometry and assessment of phosphatidylserine (PS) exposure by annexin V-FLUOS (Boehringer Mannheim, Mannheim, Germany) binding according to the manufacturer’s instructions. Cell membrane permeability was assessed by determining uptake of the DNA-binding fluorescent dye propidium iodide (PI; 2.5 μg/ml) after incubation for 5–10 min. The C92-605 mAb and the Cytofix/Cytoperm kit (BD PharMingen) were used for intracellular staining of active caspase-3 according to the manufacturer’s instructions. To avoid unspecific mAb binding, fixed and permeabilized cells were preincubated with human IgG (Octagam; Octapharma, Ziegelbrücke, Switzerland; 100 μg/ml) for 10 min in Perm/Wash solution before intracellular staining. DNA fragmentation was examined with the TUNEL assay using terminal transferase and biotin-16-dUTP obtained from Roche (Mannheim, Germany) and streptavidin-FITC obtained from Dako. In each case, data were collected for 10,000 cells. The impact of mAb treatment on resting and activated PBMC T cells was determined by enumeration of cells in the lymphocyte region using TruCount tubes (BD Biosciences) containing fluorescent-dyed microbeads and flow cytometry, essentially as described (50). Resting PBMC (1 × 106 cells/ml) were incubated with Ad20, MEM 131, or isotype control mAb TEPC 183 (2 μg/ml) for 24 h. PBMC stimulated with the anti-CD3ε mAb OKT3 (1 μg/ml) for 18 h were finally cultured for an additional 6 h with Ad20, MEM 131, or isotype control mAb TEPC 183 (2 μg/ml) and then analyzed. For every donor, the impact of each mAb was determined at least in quadruplicate on both unactivated and preactivated T cells. Following incubation, harvested cells were stained for four-color analysis of CD4, CD8, CD45RA, and CD45RO expression, resuspended in an equal volume of buffer, and transferred to TruCount tubes containing known numbers of fluorescent microbeads (counts). Under each condition, 1000 microbeads were collected and the number of lymphocytes determined. Mature peripheral T cells gradually acquire susceptibility to apoptotic signaling by Fas and TNF receptors, and this represents the basis for control of immune responses by activation-induced cell death (AICD). However, it is not clear how the immune system may regulate death signaling in T cells that are nonresponsive to engagement of Fas and TNF receptors. To identify DRs that may have a regulatory role in earlier stages of T cell development, we screened for functional mAbs raised against the immature human T cell line PFI-285 (59). A new mAb (Ad20, IgMκ) reacting with CD99 (Fig. 1⇓) was produced and found to recognize distinct epitopes at a distant region of the CD99 molecule as compared with the mAb O662 (Fig. 2⇓), which has previously been implicated in CD99-mediated death signaling in thymocytes (57). 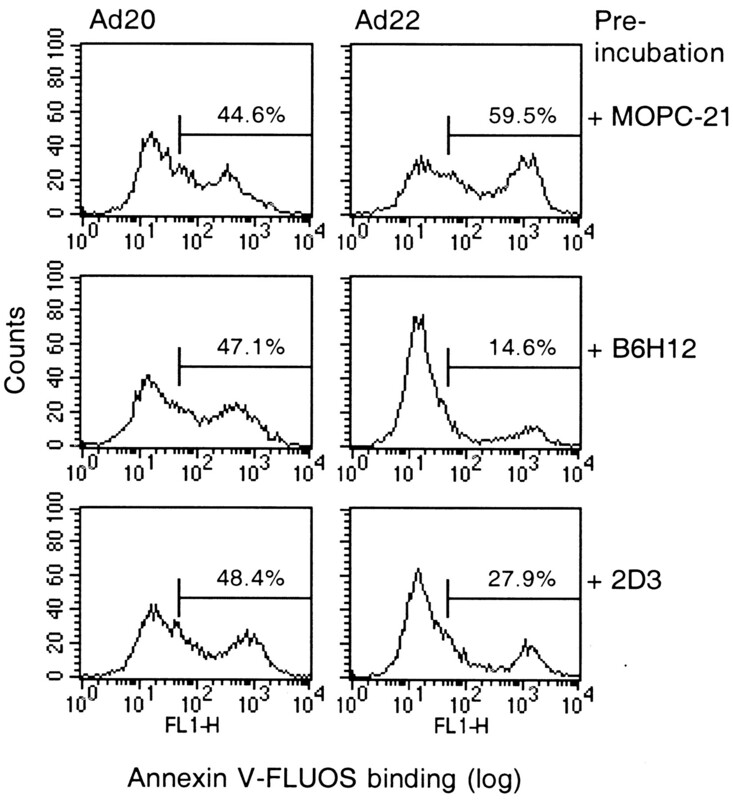 Immunoprecipitation and Western blotting experiments further confirmed that Ad20 recognized CD99 (data not shown). Assessments with Jurkat E6 cells revealed that mAb Ad20 induced cell aggregation and that Ad20 also rapidly induced morphological changes consistent with activation of PCD (Fig. 3⇓A and data not shown). 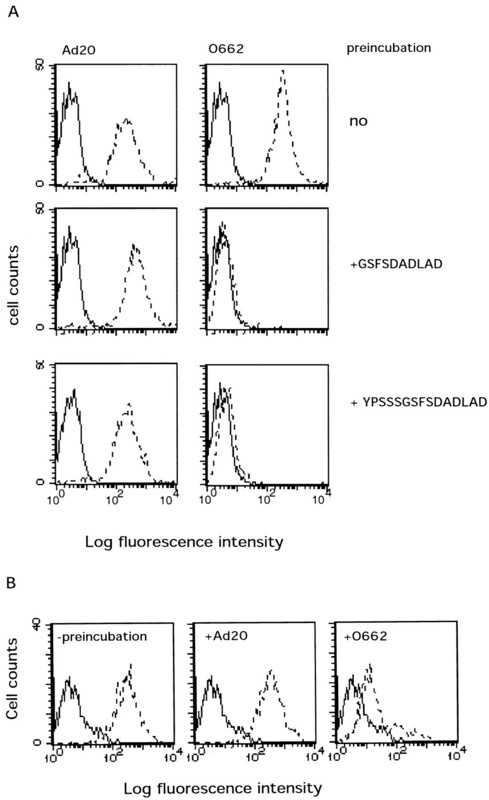 Immunofluorescence analysis of mAb Ad20 binding to CD99. 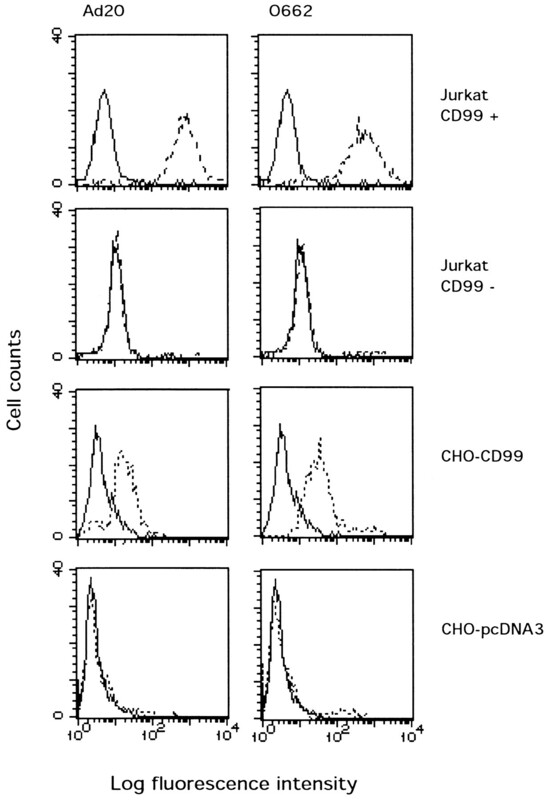 The reactivity of Ad20 with CD99 was compared with O662 using WT Jurkat T cells, Jurkat cells deficient for CD99, CHO cells transfected with the cDNA of CD99, and CHO cells transfected with the pcDNA3 vector. Solid lines represent the negative control, whereas the dotted lines represent the results obtained with mAbs Ad20 and O662. Monoclonal Abs Ad20 and O662 recognize different epitopes and domains on the CD99 molecule. A, mAbs Ad20 and O662 were preincubated with peptides that specifically mimic the O662 region of CD99 or with PBS as indicated before staining of Jurkat cells, as described in Materials and Methods. Shown are the histogram profiles of Ad20 and O662 reactivity (dotted lines) with Jurkat cells after preincubation. B, Jurkat cells were preincubated with mAb Ad20 or O662 (10 μg/ml), washed, and finally stained with FITC-labeled mAb O662 (10 μg/ml). The histograms display O662-FITC reactivity (dotted lines) without preincubation and with Ad20 and O662 preincubation as indicated. Ligation of distinct CD99 epitopes induces changes in cell morphology and exposure of PS. Jurkat E6 cells were cultured with anti-CD99 mAbs or isotype control mAb TEPC 183 (1 μg/ml) as indicated and analyzed by flow cytometry. A, Assessments of changes in light scattering properties induced by mAb Ad20. The percentage of viable cells defined by the region R1 is indicated. B, Annexin V-FLUOS staining induced following 2-h incubation with anti-CD99 mAb Ad20, MEM 131, HO36-1.1, L129, O662, or control mAb TEPC 183. C, Dose response of Ad20 after 3 h based on assessments of annexin V-FLUOS staining. Progression of apoptosis can be followed by two-color FACS analysis (FL1 vs FL2) based on assessments of PS exposure using annexin V-FLUOS binding (FL1) and uptake of PI (FL2) (62). Characteristically, early and intermediate apoptotic cells are annexin V positive and PI negative, whereas late apoptotic/dead cells with a compromised cell membrane stain both annexin V positive and PI positive. Thus, to further explore the role of CD99 and the Ad20 domain in T cell death signaling, we performed flow cytometric analysis of PS exposure and uptake of PI on Jurkat E6 T cells incubated with anti-CD99 mAbs Ad20, MEM 131, HO36-1.1, L129, and O662 (1 μg/ml). These assessments clearly revealed that mAb Ad20 rapidly induced death signaling in Jurkat T cells as determined by a marked increase in both apparently apoptotic cells (annexin V+/PI−) and late apoptotic/dead cells (annexin V+/PI+) (Figs. 3⇑, B and C, and 4). Cells in the characteristic apoptotic stage were clearly observed within 30 min of Ad20 treatment, and Ad20 responses reached a maximum within 3 h based on assessments with annexin V-FLUOS staining and uptake of PI (Fig. 4⇓). Also, treatment with the anti-CD99 mAb HO36-1.1 induced significant, but a more moderate, exposure of PS and uptake of PI (Figs. 3⇑B and 4). In contrast, with Jurkat cells cultured with mAb MEM 131, L129, or O662 for 2 or 3 h, <30% of annexin V-FLUOS binding was consistently observed (Figs. 3⇑B and 4 and data not shown). Experiments with CD99-deficient Jurkat cells showed that these cells were completely resistant to Ad20 (data not shown), directly confirming a functional requirement for CD99 eexpression in Ad20-induced T cell death signaling. Also, we further confirmed that Ad20/CD99-mediated death responses were not a consequence of complement activation because Jurkat E6 cells revealed the same characteristic death responses to Ad20 in medium containing 10% heat-inactivated (56°C, 30 min) FCS (data not shown). Thus, engagement of distinct CD99 epitopes induces rapid T cell death signaling. Kinetics of PS exposure and uptake of PI following ligation of different CD99 epitopes. Jurkat E6 cells were cultured with anti-CD99 mAbs Ad20, MEM 131, HO36-1.1, or control mAb TEPC 183 (1 μg/ml) as indicated and examined for annexin V-FLUOS binding and uptake of PI with flow cytometry. The numbers at the top of the dot plots indicate the percentage of cells in the lower right (LR) and upper right (UR) regions, respectively. Although normal mature T cells gradually acquire susceptibility to FasL-mediated death signaling (3, 4, 7), the impact of TRAIL is apparently controlled by expression of decoy receptors (17, 18, 25, 26, 27). To examine whether CD99-mediated death responses involved Fas- or TRAIL DR-mediated signaling pathways, we first compared the impact of mAb Ad20 with the apoptosis-inducing anti-Fas mAbs CH11 and DX2 and recombinant human TRAIL (obtained from both Calbiochem and R&D) on Jurkat E6 cells. Monoclonal Ab DX2 (IgG1) was cross-linked with recombinant protein G to induce maximal Fas signaling. PCD responses were determined by examining annexin V-FLUOS binding and uptake of PI with flow cytometry. These studies showed that Jurkat cells cultured for 3 and 5 h responded significantly to both anti-Fas and TRAIL treatment (Fig. 5⇓ and data not shown). However, death responses to anti-Fas and TRAIL proceeded kinetically slowly compared with Ad20-induced death signaling. Ad20 treatment induced a relative constant proportion of cells (23–31%) in the characteristic transit apoptotic stage (annexinV+/PI−) during the 0.5- to 3-h period, with an accompanying steady increase in dead cells (12–63.5%; Figs. 4⇑ and 5⇓). In the same time period, anti-Fas and TRAIL induced accumulation of cells in the early/intermediate apoptotic stage with no significant increase in the number of dead cells (Fig. 5⇓ and data not shown). Comparable responses were observed with TRAIL obtained from two different manufacturers (data not shown). Thus, the data in Figs. 4⇑ and 5⇓ suggest that CD99-mediated death signaling may represent a major pathway in control of T cells. Comparison of death responses mediated by CD99, Fas, and TRAIL DRs. Jurkat E6 cells were cultured with 1 μg/ml mAb or recombinant human TRAIL (Calbiochem) as indicated for 3 h. Recombinant protein G (1 μg/ml) was added to cultures with anti-Fas mAb DX2 and isotype control mAb MOPC-21 for cross-linking. Death responses were determined by assessments of annexin V-FLUOS binding and uptake of PI with flow cytometry. The numbers at the top of the dot plots indicate the percentage of cells in the lower right (LR) and upper right (UR) regions, respectively. We next questioned whether the Ad20/CD99-mediated death pathway in general was functional in transformed, malignant T cells. Therefore, we examined the impact of Ad20 on the human T cell lines PFI-285, SR, MOLT-3, MOLT-4, HPBALL, CCRF-CEM, and SUP-T1. Experiments with anti-Fas (CH11 and DX2) and TRAIL treatment were included to further evaluate a possible involvement of TNFR family DRs in CD99-mediated death signaling and also to explore the functional role of Fas and TRAIL DRs on malignant T cells. All cultures were performed for 5 h. These experiments clearly revealed distinctions between the impact of Ad20 as compared with anti-Fas and TRAIL treatment (Fig. 6⇓ and data not shown). With the exception of SUP-T1, Ad20 induced significant death responses of all the cell lines with HPBALL, SR, MOLT-3, and MOLT-4 as very responsive (>55% annexin V+ cells) and CCRF-CEM and PFI-285 as more moderately responsive (Fig. 6⇓). Increasing the incubation time of SUP-T1 with Ad20 to 18 h did not induce any observable changes in cell morphology or survival, as determined with FACS analysis (data not shown). Notably, resistance to Ad20 treatment was not due to lack of CD99 expression, because SUP-T1, like all the other cell lines examined, stained positive with Ad20 (data not shown). Similarly, resistance to Ad20/CD99-mediated death signaling was also observed with the CD99+ B cell lines U698 and C1R and the myeloid cell lines U937, KG1a, HL60, and K562 (data not shown). T cell death responses to ligation of CD99, Fas, and TRAIL DRs. T cell lines were cultured with 1 μg/ml mAb TEPC 183, Ad20, CH11, or recombinant human TRAIL (Calbiochem) for 5 h as indicated. Cell death was determined by examining annexin V-FLUOS binding with flow cytometry. Notably, incubation with anti-Fas and TRAIL had no or only minor impact on most of the T cell lines (Fig. 6⇑ and data not shown). However, the SR T cell line was even more responsive to TRAIL treatment as compared with the impact of Ad20 (Fig. 6⇑ and data not shown). These data suggest that CD99-mediated death signaling proceeds independently of Fas and TRAIL DR activation and that transformed T cell lines in general are more susceptible to death signaling mediated by CD99 as compared with Fas and TRAIL DRs. Induction of apoptosis following ligation of Fas and TRAIL DRs requires recruitment of initiator caspases, such as caspase-8, to the receptors’ death domain (1). This enables subsequent processing and activation of downstream effector caspases, normally resulting in DNA fragmentation and ordered desintegration of the cell. Recent studies suggest that PCD may also proceed independently of caspase activation (45, 46, 47, 48, 49, 50, 51, 52, 63, 64). To determine the role of caspases in Ad20-induced T cell death signaling, we first examined the impact of the caspase-3 inhibitor Z-DEVD-FMK and the general caspase inhibitor Z-VAD-FMK on Jurkat E6 responses to Ad20. Control cultures with anti-Fas and TRAIL were also included. Cells were incubated with caspase inhibitors for 60 min before the addition of Ad20, CH11, isotype control mAb TEPC 183, or TRAIL and were further cultured for 3 h. Death responses were determined by assessments of annexin V-FLUOS binding and uptake of PI with flow cytometry. These experiments clearly revealed that Z-DEVD-FMK and Z-VAD-FMK did not interfere with Jurkat E6 responses to Ad20 (Fig. 7⇓ and data not shown). In contrast, both caspase inhibitors completely suppressed Jurkat E6 death responses to anti-Fas and TRAIL treatment (Fig. 7⇓ and data not shown). We next examined activation of caspase-3, which is a major effector caspase, in Jurkat cells cultured with Ad20 or control mAb TEPC 183 for 1, 2, or 3 h. Cultures incubated with TRAIL for 3 and 4 h were included as positive controls. Assessments of caspase-3 activation were performed by intracellular staining using a mAb specific for the active form of caspase-3 and flow cytometry. These experiments revealed no activation of caspase-3 in Jurkat cells incubated with Ad20 or control mAb, but confirmed TRAIL-induced activation of caspase-3 (Fig. 8⇓A and data not shown). We also examined whether Ad20 induced DNA fragmentation in Jurkat cells using the TUNEL assay and flow cytometry. In these experiments Jurkat cells were cultured for 1, 2, and 3 h with Ad20 (0.1, 0.5, and 1.0 μg/ml) or control mAb TEPC 183. Cultures for 3 and 4 h with TRAIL and CH11 were included as positive controls. 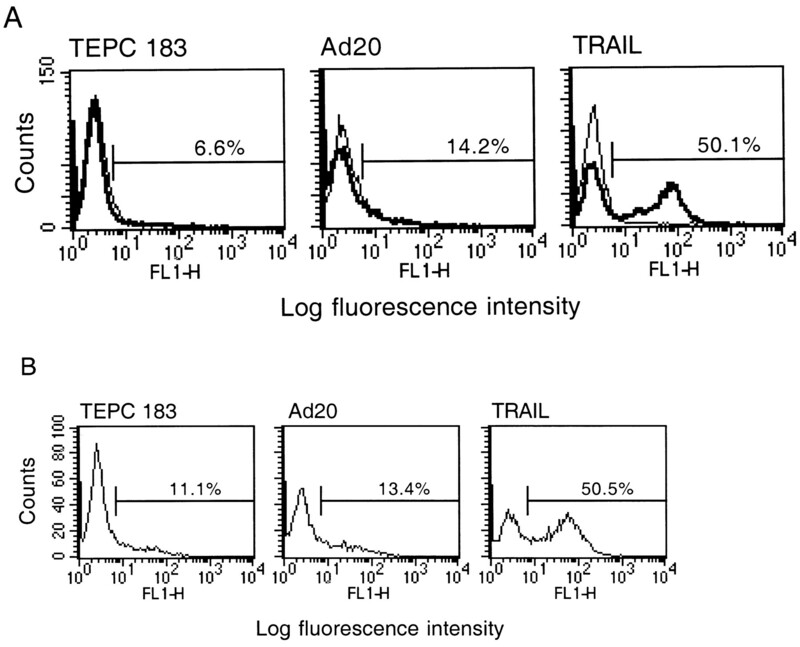 These assessments showed no classical DNA fragmentation in Jurkat cells incubated with Ad20 or control mAb TEPC 183 (Fig. 8⇓B and data not shown). In contrast, with TRAIL and CH11, induction of DNA fragmentation in Jurkat cells was evident (Fig. 8⇓B and data not shown). Taken together, Ad20/CD99-mediated T cell death signaling apparently does not require caspase activation and also proceeds independently of Fas and TRAIL DR activation by a distinct pathway. Ad20-induced death signaling proceeds independently of caspase activation. Jurkat E6 cells were preincubated with the indicated caspase inhibitors (100 μM) or 0.5% DMSO for 60 min before further culture for 3 h with 1 μg/ml mAb Ad20, CH11, TEPC 183, or TRAIL, as shown. Cell death was determined by examining annexin V-FLUOS binding with flow cytometry. Results are representative of two separate experiments performed in duplicate. Monoclonal Ab Ad20-induced cell death proceeds without activation of caspase-3 or DNA fragmentation. Jurkat E6 cells were cultured with 1 μg/ml Ad20 or control mAb TEPC 183 for 2 h or 1 μg/ml recombinant human TRAIL (Calbiochem) for 4 h as indicated. A, Activation of caspase-3 was examined with intracellular staining using a mAb (clone C92-605) specific for the active form of caspase-3 and flow cytometry. Thin lines represent staining with negative control mAb, whereas bold lines represent the results obtained with the anti-active caspase-3 mAb. The percentage of positive cells is indicated. B, DNA fragmentation was examined with the TUNEL assay. Incorporation of biotin-16-dUTP was determined using streptavidin-FITC and flow cytometry. The percentage of stained cells is indicated. TCR/CD3-mediated signaling plays a critical role both in negative selection of thymocytes (65) and in control of T cell responses by AICD (4, 5, 6, 7). TCR signaling involves the tyrosine kinase p56lck, which associates with the cytoplasmic domain of CD4 and CD8 (66, 67, 68). CD45 expression is also required for p56lck activation and TCR signaling (66, 69, 70). Recent studies implicate CD4 and CD45 in T cell apoptosis (45, 46, 52, 71, 72, 73) and suggest a functional requirement for p56lck in AICD of Jurkat T cells (74, 75). To examine whether Ad20/CD99-mediated death signaling required functional CD3, CD4, CD45, or p56lck, we examined the impact of Ad20 on established variant Jurkat T cell lines selected for deficient expression of TCR/CD3 (clone J.RT3-T3.5), CD4 (clone D1.1), CD45 (clone J45.01), or deficient p56lck signaling (clone J.CaM1.6). Cultures with Jurkat E6 cells were included as controls. Based on assessments with annexin V binding and FACS analysis, we found that the variant Jurkat cell lines all responded significantly to Ad20 treatment (Fig. 9⇓). The CD4−, CD45−, and p56lck− cell lines responded to Ad20 treatment comparably to Jurkat E6 cells (Fig. 9⇓). Assessments with Jurkat J.RT3-T3.5 cells also showed that Ad20-induced death signaling could proceed independently of TCRαβ/CD3 expression (Fig. 9⇓). The comparably more moderate Ad20-induced PS exposure on this mutant cell line, which was produced by ethylmethanesulfonate treatment, may reflect that other signaling pathways relevant to death control may have been altered during the mutagenesis process. In contrast, no death responses were observed in cultures with MEM 131 or isotype control mAb TEPC 183 (Fig. 9⇓). Thus, Ad20/CD99-mediated death signaling appears to proceed independently of major signaling pathways implicated in control of thymocytes and mature peripheral T cells. CD99 signals PCD independently of functional CD3, CD4, CD45, or p56lck. Jurkat E6 and variant Jurkat cells deficient in TCRαβ/CD3 (J. RT3-T3.5), CD4 (D1.1), CD45 (J45.01), and p56lck (JcaM1.6) were cultured with anti-CD99 mAbs Ad20, MEM 131, or control mAb TEPC 183 (1 μg/ml) for 3 h and examined for annexin V-FLUOS binding with flow cytometry. Percentage of annexin V-positive cells following Ad20 incubation (solid, bold lines) is indicated. 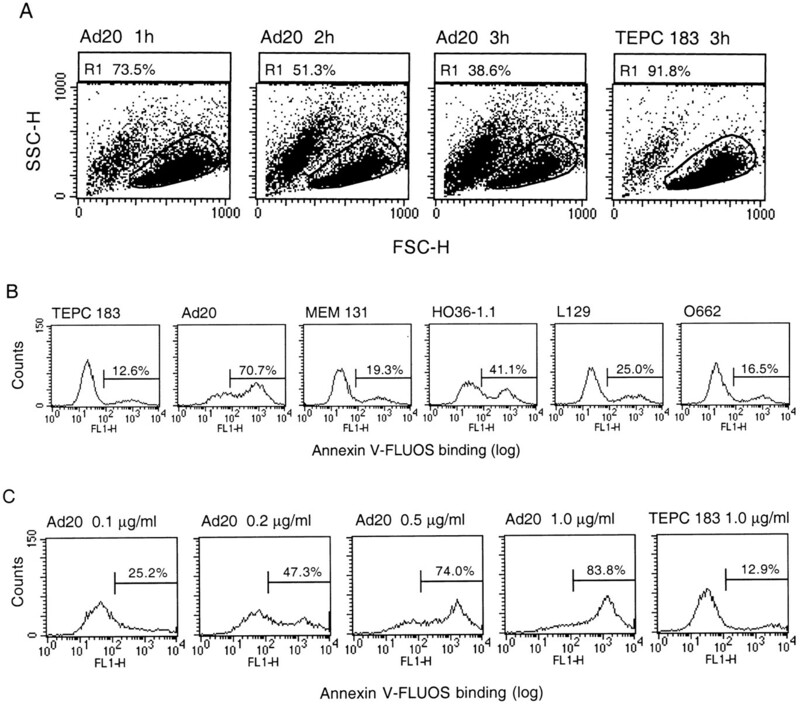 The other histograms represent annexin V-FLUOS staining following TEPC 183 (solid lines) and MEM 131 (dotted lines) incubation. Ligation of distinct epitopes on the IgV domain of CD47 has recently been shown to induce PCD of T cells by a pathway with close resemblance to Ad20/CD99-mediated death signaling (50). The functional site for activation of CD47-mediated T cell death is blocked by mAb B6H12; and mAb 2D3, directed to a distant region of the CD47 molecule, also restrains CD47-mediated T cell death signaling (50). To address whether Ad20/CD99-mediated death signaling involved activation of CD47, we examined whether mAbs B6H12 and 2D3 interfered with mAb Ad20-induced responses. In these experiments, Jurkat E6 cells were preincubated with excess anti-CD47 mAbs or isotype control mAb MOPC-21 for 15 min and further cultured with Ad20 or Ad22 as a positive control for 60 min. Assessments of death responses were based on analysis of annexin V binding with flow cytometry. In these experiments, we found no impact of interference with CD47 activation on Ad20 responses (Fig. 10⇓), suggesting that Ad20/CD99- and CD47-mediated death signaling proceeds by different pathways. CD99 signals T cell death independently of CD47 activation. Jurkat E6 cells were preincubated with 10 μg/ml anti-CD47 mAbs B6H12 and 2D3 or isotype control mAb MOPC-21 as indicated and further cultured for 1 h with 1 μg/ml mAb Ad20 or Ad22 as indicated. PCD was determined by examining annexin V-FLUOS binding with flow cytometry. To further compare T cell death signaling mediated by CD99 and CD47, we next determined the impact of Ad20 and Ad22 on the T cell lines MOLT-3, MOLT-4, HPBALL, CCRF-CEM, SR, PFI-285, and SUP-T1 in cultures for 3 h. As with CD99 expression, FACS analysis also confirmed expression of CD47 on all the T cell lines (data not shown). Isotype control mAbs TEPC 183 and MOPC- 21, anti-CD99 mAb MEM 131, and anti-CD47 mAb 2D3 were included as negative controls. PCD responses were assessed by FACS analysis of annexin V binding. In most cases, a parallel pattern between responses to Ad20 and Ad22 was observed (Fig. 11⇓). MOLT-3 responded with >70% annexin V-FLOUS staining to both mAb Ad20 and Ad22 (Fig. 11⇓). Generally, Ad20/CD99 activation revealed a greater impact as compared with Ad22/CD47 activation (Fig. 11⇓). However, SUP-T1, which is resistant to Ad20, revealed a moderate response to CD47 engagement. No significant responses were observed with the control anti-CD99 mAb MEM 131 or anti-CD47 mAb 2D3. Comparison of T cell death mediated by CD99 and CD47. T cell lines were cultured with 1 μg/ml anti-CD99 mAbs Ad20 and MEM 131, anti-CD47 mAbs Ad22 and 2D3, or control mAbs TEPC 183 or MOPC-21 for 3 h as indicated. 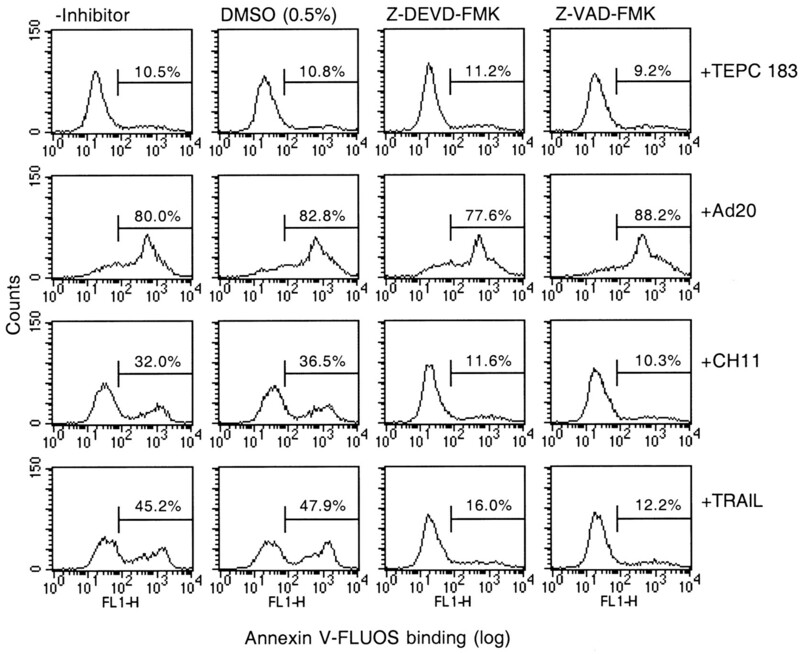 Cell death was determined by assessments of annexin V-FLUOS binding with flow cytometry. It is not clear to what extent the immune system takes advantage of costimulation of DRs to eliminate excess T cells or target cells. To further compare the novel caspase-independent CD47 and CD99 death signaling pathways and also to explore the potential in combined activtion of CD99 and CD47, we next compared the impact of Ad20 and Ad22 alone and in combination on the cell lines MOLT-3 and CCRF-CEM. Cultures with combinations of Ad20 and Ad22 with relevant isotype control mAb were included as controls. As shown in Fig. 12⇓, combined treatment with Ad20 and Ad22 increases the death response as compared with cultures incubated with Ad20 or Ad22 with isotype control mAb. Together, our data suggest that CD47 and CD99 represent different death pathways that may have biologic roles in control of transformed T cells. Enhanced T cell death responses to combined CD99 and CD47 stimulation. 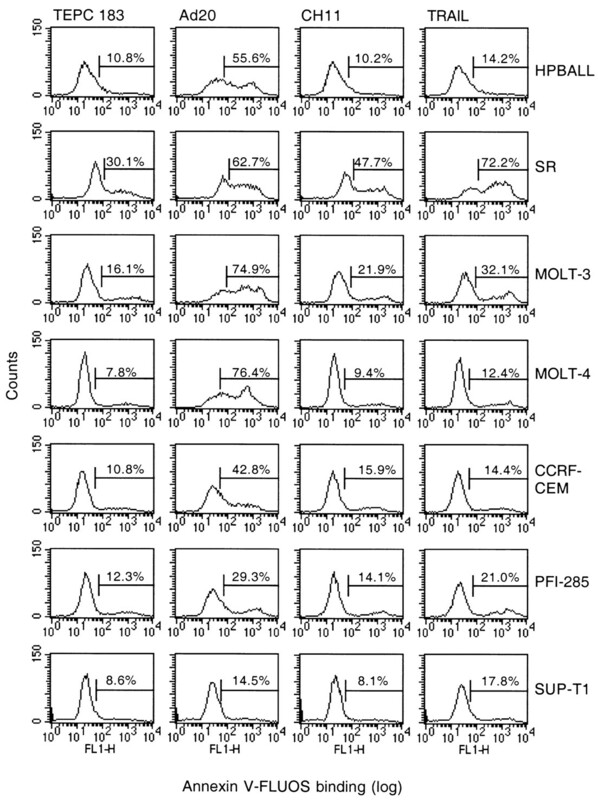 The T cell lines MOLT-3 and CCRF-CEM were cultured with different combinations of mAb Ad20, Ad22, and isotype control mAbs TEPC 183 and MOPC-21 (1 μg/ml) for 3 h as indicated. 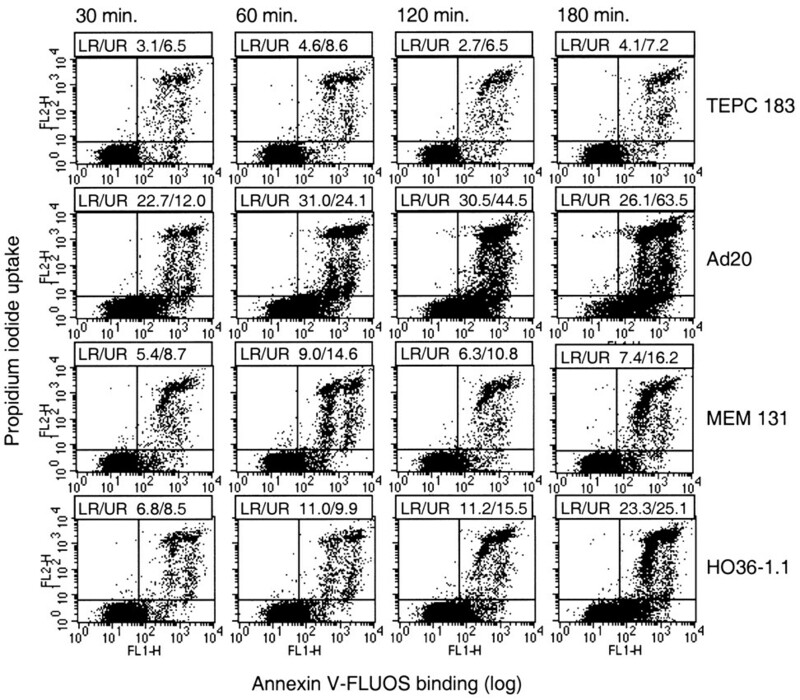 Death responses were determined by examining annexin V-FLUOS binding with flow cytometry. Ligation of distinct epitopes on CD99 and CD47 can rapidly induce death of T cell lines, and CD47-mediated death signaling is also observed with CD3ε-activated normal T cells (50). Thus, to address a possible role for CD99-mediated death signaling in normal peripheral T cells, we next examined the impact of Ad20 and control mAbs MEM 131 and TEPC 183 on normal resting and OKT3-preactivated PBMC T cells. TruCount tubes and FACS analysis were used for assessments of relative numbers of lymphocytes. Notably, with resting and OKT3-stimulated PBMC T cells from five different donors, we found no death responses of CD4+ or CD8+ T cells to Ad20 treatment as compared with control cultures with MEM 131 or TEPC 183 (data not shown). Taken together, Ad20/CD99 activation reveals profound impact on transformed T cell lines but apparently has no effect on most normal peripheral T cells. Proper activation of DRs is critical in regulation of T cell development and function. However, the nature of functional receptors, which are expressed on T cells at stages characterized by resistance to the impact of FasL, TNF, and TRAIL, remains to be established. In this study, we have shown that engagement of distinct epitopes on CD99 induced rapid death signaling in the majority of immature T cell lines examined, apparently by a caspase-independent pathway. In contrast, only a few T cell lines were distinctly responsive to apoptosis-inducing anti-Fas and TRAIL. Differences between the Ad20/CD99-mediated death pathway and other novel nonclassical apoptotic pathways were also observed. Thus, our data suggest that CD99 may be a major DR used by the immune system to control T cells at stages before they acquire susceptibility to the impact of death-mediating cytokines of the TNF superfamily. Previous studies have shown that activation of the CD99 domain specified by mAbs O662, L129, and DN16 specifically induces apoptosis in thymocytes and Ewing’s sarcoma cells (57, 76). Death responses were restricted to immature CD4+CD8+ thymocytes with an intermediate expression of CD3 (57) and undifferentiated Ewing’s sarcoma cells (76). These responses were dependent on caspase activation but proceeded independently of the Fas death pathway. Compared with Fas responses, mAb O662/CD99-induced apoptosis revealed much slower kinetics (57). Peptide and mAb blocking experiments made it clear that Ad20 and O662 are directed to different epitopes and that Ad20 defines a distant and novel functional domain on the CD99 molecule. Short-term cultures further revealed that Ad20 and HO36-1.1 were the only anti-CD99 mAbs consistently capable of rapidly inducing T cell death. The reason why two different CD99 domains are linked to two distinctly different death pathways is not clear, but studies with MHC class I molecules demonstrate a similar complex situation in which ligation of distinct domains either induce caspase-dependent or caspase-independent PCD (47, 48, 49, 77). TRAIL is considered to selectively induce apoptosis of cancer cells but not normal cells (28, 29). With the T cell lines examined, we found that only SR and Jurkat T cells responded profoundly to TRAIL. These two cell lines were also the only cell lines distinctly responsive to Fas ligation. The observed differences in responses to TRAIL and anti-Fas, as compared with the impact of Ad20 and the marked differences in requirement for caspases to induce cell death, strongly suggest that Ad20/CD99-mediated cell death proceeds independently of Fas or TRAIL DR activation. Furthermore, because previous assessments with Jurkat E6 T cells showed no responses to 5-h TNF-α or TNF-β treatments (50), we also conclude that Ad20 responses proceed independently of TNFRI/II activation. TCR/CD3 signaling controls thymocyte selection and sensitizes peripheral T cells for AICD (4, 5, 6, 7, 65). The CD4 coreceptor, p56lck, and CD45 modulate TCR signaling, and these molecules have also been directly implicated in control of T cell apoptosis (45, 46, 52, 71, 72, 73, 74, 75). However, Ad20/CD99-mediated T cell death revealed no requirements for functional TCR/CD3, CD4, CD45, or p56lck. These observations exclude central components in TCR signaling as major control elements in promoting CD99-mediated cell death and demonstrate that Ad20/CD99-mediated death response is not a consequence of CD45 activation. Caspases are central executioners of death, and recruitment and activation of caspases is critical for death signaling by receptors belonging to the TNFR family (1). However, the mechanisms for how T cells die in response to Ad20 have not been established. Decrease in cell volume, changes in morphologic appearance, and progression through an annexin V-positive and PI-negative stage following Ad20 treatment were observations in agreement with activation of CD99-mediated PCD. Nevertheless, Ad20-induced PCD revealed no requirement for caspase activity or any evident induction of classical DNA fragmentation. Similarly, recent studies suggest that caspase-independent and nonclassical forms of apoptosis can be activated by engagement of distinct cell surface Ags such as MHC class I and MHC class II molecules, CD2, CD4, CXCR4, CD45, and CD47 (45, 46, 47, 48, 49, 50, 51, 52, 63, 64). Furthermore, proapoptotic molecules such as Bax and AIF may also execute cell death independently of caspase activation (78, 79). Thus, in addition to classical apoptosis, other forms of cell death under molecular control seem to have biologic relevance. Oncosis was originally used to define ischemic cell death with swelling. Recently, it has been shown that a mAb directed to a cell surface receptor called porimin rapidly induced cell membrane damage and death of Jurkat cells by a type of cell death similar to oncosis (80). Notably, within 20 min of culture with the anti-porimin mAb, >75% of the Jurkat cells stained PI positive. Consequently, it is clear that Ad20/CD99-mediated cell death proceeds more slowly than receptor-mediated oncosis but more quickly than death mediated by engagement of Fas and TRAIL DRs. The kinetics of Ad20/CD99-mediated exposure of PS and uptake of PI also suggest that T cells dying in a normal biologic setting as a consequence of CD99-ligation should be efficiently removed by macrophages without causing inflammation (81, 82). Although there were several similarities between Ad20/CD99-mediated and CD47-induced T cell death signaling, functional blocking of CD47 activation had no impact on Ad20 responses. Notably, whereas CD47 has also been implicated in death signaling in activated normal T cells (50), Ad20 induced no observable death responses of resting or activated normal peripheral T cells. Decoy receptors are considered to protect normal cells from TRAIL-induced apoptosis (16, 17, 18, 19, 25, 26, 27). However, recent studies with melanoma cell lines suggest that additional factors regulate TRAIL responses, as there was no correlation between the expression of DcR1 or DcR2 and resistance or sensitivity to TRAIL (83, 84). Different mechanisms may also account for resistance to Fas ligation. The recent identification of a Fas decoy receptor that is expressed on thymocytes is consistent with receptor-mediated inhibition of FasL-mediated apoptosis in developing T cells (85). In mature peripheral T cells, the intracellular level of Fas-associated death domain-like IL-1-converting enzyme-like inhibitory protein seems to play a major role in controlling the susceptibility to Fas-mediated apoptosis (86). The factors that control sensitivity or resistance to Ad20/CD99-mediated death signaling are not established. Previous studies with thymocytes and Ewing’s sarcoma cells show that susceptibility correlates with high expression of the CD99 Ag (57, 76). We found no clear relation between CD99 expression and responses to Ad20. All cell lines tested stained brightly for CD99 expression, and the two most resistant T cell lines SUP-T1 and PFI-285 represented T cells with the lowest and highest Ad20 staining intensity, respectively (data not shown). A truncated isoform of CD99, designated CD99 type II, has recently been discovered and is characterized by only 13 amino acid residues in its putative cytoplasmic domain (87). Overexpression of CD99 type II is shown to regulate CD99-mediated and spontaneous aggregation of lymphocytes by reducing the level of LFA-1 expression (87). The role of CD99 type II in control of CD99-mediated PCD has not been addressed. However, the apparently relative low transcription level of CD99 type II in PBLs and the relatively higher transcription level in MOLT-4 (87) may suggest that CD99 type II has a biologic function other than serving as a decoy receptor for a putative death-inducing CD99 ligand. Regulated signaling by different DRs appears to impose a selective pressure on T cells at several stages during their life span, from negative selection in the thymus to final depletion of excess mature peripheral T cells. The current picture reveals that mature peripheral T cells gradually develop susceptibility to FasL- and later TNF-mediated death signaling and that these cytokines are the major death ligands implicated in depletion of T cells by AICD (3, 4, 7, 11). The picture is less clear regarding the role of Fas and TRAIL DRs and other receptors in control of T cell death at earlier stages. In developing thymocytes, the Fas Ag has been implicated in death signaling (88), but a requirement for CD95 in T cell selection has also been questioned (89). Notably, nonclassical forms of apoptosis may be important in T cell selection because PCD in developing thymocytes can proceed independently of caspase enzyme activity (90). Thus, CD99 is a strong candidate for regulation of cell death in the thymus by caspase-dependent and caspase-independent pathways. Activation of caspase-independent death pathways may represent a critical strategy to avoid development and expansion of autoreactive T cells in situations in which progenitor T cells are infected with virus that can interfere with normal mobilization and activation of caspases. Recent studies present CD2, CD4, CXCR4, CD45, HLA class I molecules, and CD47 as novel DRs on T cells linked to caspase-independent signaling pathways (45, 46, 47, 48, 49, 50, 51, 52, 63, 64). Although these novel death pathways appear to be functional in both immature and mature T cells, CD99-mediated T cell death signaling appears to be restricted to earlier stages of T cell development. Thus, mature peripheral T cells express CD99 but appear to be nonresponsive to Ad20, suggesting that resistance to CD99-mediated death signaling is acquired during later stages of T cell maturation. A functional role for CD99 in controlling responses and expansion of newly developed and Ag-challenged naive T cells needs to be further examined. Activation of caspases plays a major role in the different strategies used by CTLs to kill target cells (1, 32, 36, 39). However, interference with normal caspase recruitment represents viral and cellular strategies for immune escape (40, 41, 42, 43, 44). Thus, Ags such as CD99 and CD47 may represent additional target Ags exploited by CTLs to challenge cancer cells and virus-infected cells resistant to signaling by DRs of the TNFR family. Identification of ligand(s) and additional control elements for CD99 should further clarify the Ags’ biologic functions. In conclusion, in this study, we have identified a new functional domain on CD99 and demonstrated that specific activation of this region activates a novel caspase-independent death pathway in T cells. Ligation of Fas and TRAIL DRs appeared to be less effective in control of transformed T cells as compared with CD99 activation. Thus, we suggest that CD99 may have major biologic role as a DR on early T cells. ↵1 This work was supported by The Norwegian Cancer Society. ↵3 Abbreviations used in this paper: FasL, Fas ligand; PS, phosphatidylserine; PI, propidium iodide; PCD, programmed cell death; AICD, activation-induced cell death; TRAIL, TNF-related apoptosis-inducing ligand; DR, death receptor; CHO, Chinese hamster ovary; WT, wild type.